Green tea, known as unfermented tea, is the variety which keeps the original colour of the tea leaves. The primary processing of China green tea inclucdes "fixation", "rolling" and "drying". Because of without fermentation during processing, the chlorophyll still remain in tea leaves, that make the green tea in green color. The history of China green tea began from 3000 years ago. The ancient Chinese plucked fresh tea leaves from wild tea plants and dry them by sunlight for storage. That's taken as the primordial processing of green tea. In the 8th century, the evaporation processing method was created. Following that, the saute processing method was created in the 12 century. The traditional processing methods still remain today. They are endlessly developed by tea technicians generation by generation. 1>Stir-fry green tea: Fresh tea leaves sauted in pan for drying. Such as gunpowder tea, Young Hyson, Chunmee,etc which mainly for export business. The super pan-fired green teas are made from tender fresh tea leasves. Many historically famous Chinese green teas are processed by pan drying method. for example, Jade fire, Dragon well green tea, Mountain Gorge, Pi Luo Chun, Lu'An Melon Slice, Xinyang Maojian. The character for stir-fry green tea is "high fragrance and strong taste". 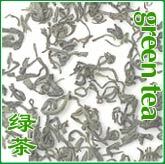 2> Roast green tea: Fresh tea leaves dried in roast basket or roast chest .The common finished products of roast green teas are usually used as material for flower-scented teas. The well-known famous roast green tea include: Huangshan Maofeng; Taiping Monkey King, etc.The character for roast green tea is "intact original shape and covered with white fluff". 3>Semi-roast & Semi-fry green tea: Combine the stir-fry method and roast method for drying. Benefited from the special drying method, the finished teas not only achieve high fragrance and strong taste, but also keep its original shape and its body covered with pretty whtie fluff. Jianzhai Emerald Eyebrow, Anji Baicha, Wuzhi Xinhao etc. 4> Solar drying green tea: Fresh tea leaves dried by sunlight. Solar drying green teas are mostly used as materials for compressed teas. 5> Steamed green tea: Fresh tea leaves steamed by high temperature for drying.The representative steamed green teas are Sencha green tea, Enshi Jade Dew. Sencha green tea is mainly for export to Japan. Green tea is as varied and unique as wines. Their uniqueness depends upon the growing region, the season's weather, time of harvesting and type of processing. Packing:In plywood cases or cartons of 20kg to 46kg,lined with aluminium foil,coated with gunny sacks and cross strapped with polytape. Each country grades their green teas differently and has their own set of complicated terminology. Chininese green tea for export is graded according to the age of the leaf and the finished style or shape of the leaf.Chinese green tea for export is in gunpowder, Imperial, Young Hyson, Hyson, Twankay, Hyson Skin or Dust style. Each of these categories possess several grades. For instance, Gunpowderg tea is graded from Pinhead to Pea Leaf and further subdivided into specia, first, second, third, fourth, fifth, sixth, seventh, and Common Gunpowder.